First of all my motto is always “learn by doing.” Now let’s get straight to the point. 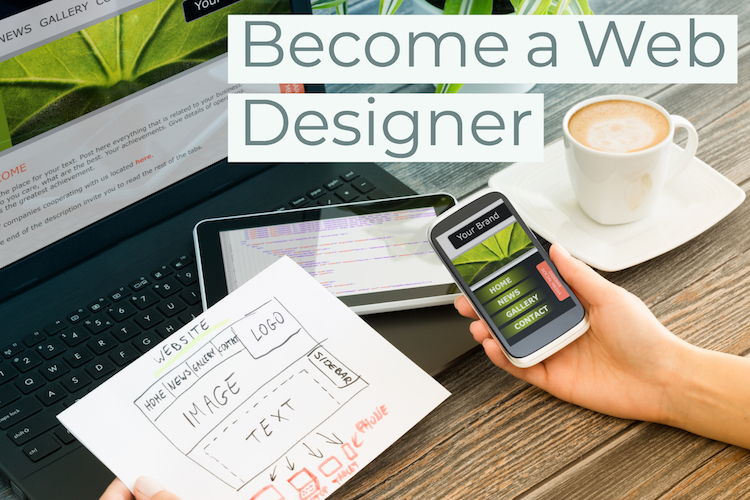 Here are five basic steps to becoming a web designer or developer. WordPress has plenty of haters, but one of the reasons people hate it is because it makes creating websites so easy. Yes, it can be used wrong, but this is the quickest way for you to create a website with any number of dynamic features and third party integrations, just make sure you learn how to use it correctly. There is no sense in recreating the wheel. WordPress is widely used because it works so well. Be sure to use WordPress.org, not WordPress.com. In my opinion, the dot com version is for website owners to create a website on their own, but it has limited features and control. The dot org version is website creators to have full control over their website. 3. Follow tutorials to create different WordPress websites. Remember my motto? It’s at the top of this post if you’ve forgotten already. Find tutorials for creating specific types of websites using WordPress, like this Make Restaurant Websites with WordPress Quickly. You will need at least three separate and distinct websites when you are done. Save each website you are going to need them later. Create a portfolio website and populate it with those tutorial websites that you already created. Most people struggle with creating a portfolio at first because they don’t have anything to put in it. Since you have been learning by doing, you are already a few steps ahead of everyone else. Now creating a portfolio will be easy because you already have the content. If you followed the tutorials word for word, now would be a good time to “make them yours” by customizing them a bit and making them unique. Of course there are tons of great WordPress portfolio themes already out there. You don’t need to make one from scratch. Now you need to tell everyone that either you are a web designer and either you are open for business or looking for a job. DON’T BE SHY. If you are going to be a closet web designer then I can’t help you. You need to put it on Facebook, Twitter, and LinkedIn. Post links to your portfolio and screenshots of the different websites. Don’t just do it once. Find excuses and think of unique and interesting ways to bring it up multiple times until you start gaining traction. Now here is the big key that will tie this all together so that when you announce yourself to the world it will have a big impact. Back in step one, announce that you are going to become a web designer. Then in steps 2 and 3 talk to everyone about how you are actually creating websites now. Maybe post screenshots as you go or at least when you finish each one. Then in step 4 mention that you are starting on your portfolio. Step 5 is linking to the portfolio and telling everyone that you are ready for business. I cannot over emphasize the importance of this bonus tip. This is the secret to getting clients or landing a job. Taking everyone in your network along with you on your journey to becoming a web designer will make them invested in you and what you are doing. Social media has a very strong psychological effect in how it makes others feel left out of what you are doing and causes them to want to be a part of it. It makes people jealous of what you have going on. Normally that’s terrible, but here you can use it for good purposes. When you finally post that portfolio, your friends and family will be stunned. You actually did it and it looks good. Ask them to repost it to their network. You can quickly get the word out to tens of thousands of people this way. Those people work in or even own business that need a web designer and that web designer is you! Bonus Bonus Tip: Even after you land a job or start getting clients, keep posting on social media about it. Of course always be respectful and only talk about others in a positive light. Never complain about anyone but yourself. It will continue to have a magical effect on your career. Why not first announce your desire to become a web designer or developer right here in the comments? Then come back and post a link to your portfolio when it is ready. I’ll gladly post your success to my Twitter network as well. FreeCodeCamp.org will teach you everything you need to become a web designer or even a frontend developer completely for free, plus they offer certificates and have an amazing community for support. I will continue to gather more resources and add them to this post, so be sure to check back later. That’s great. I’m glad it helped. Let me know if you have any questions. The best way to reach me is on Twitter. I started a web development course on udemy a month ago. I’m doing it slowly atm because of a fulltime job that takes the cake out of me and its hard to sit several hours after work. Anyway, I am really trying to become a web developer in the not so distant future! I have a website up and running, where I’m documenting my journey and updating the site as I learn! I’ve just started to learn CSS and I really enjoy this! I’ve really been diving into static site generators. You can host sites on Github Pages, GitLab and Netlify for free. Not that WordPress isn’t bad, I just enjoy learning new things. Also checkout Roots Trellis. It’s an awesome DevOp tool that keeps parity between local, staging and production servers too.